Are you planning on playing lacrosse in high school next year? Application Deadline is May 8th, 2019, so don’t delay. Winner will be announced at the Cow Plop fundraiser on May 19th. 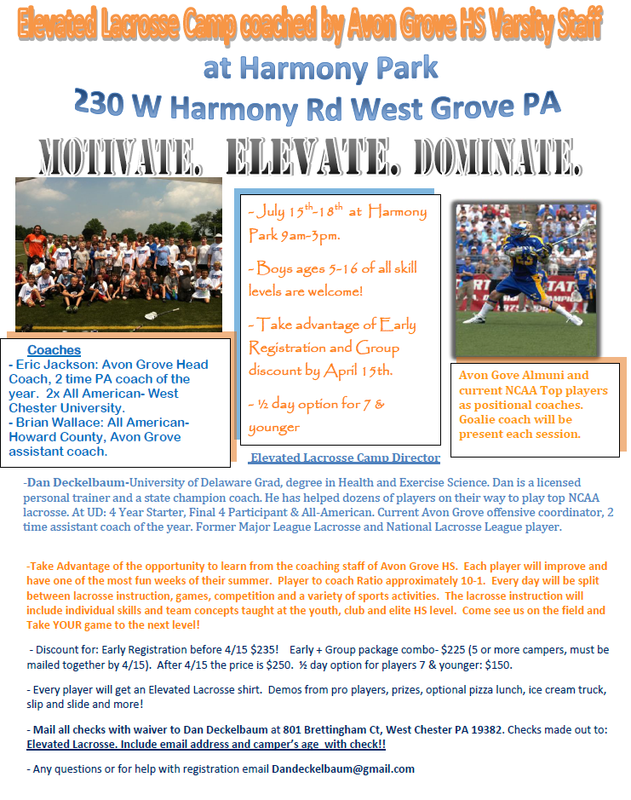 Tomorrow is the last day to get the early registration/group discount for the Elevated Lacrosse Camp. Emily Cox will be at the High School from 5:45-7:30 tomorrow practicing on the turf and can collect the forms and checks to mail in. 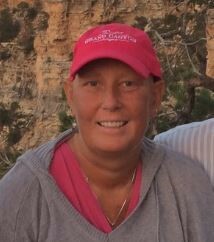 If you can swing by the High School and give them to her she will mail all the forms in together. If you have any questions please contact us at or contact Dan Deckelbaum at the email address below. !! Elevated Lacrosse Camp !! Come out and learn from the 2017 PIAA State Champions, Avon Grove High School Lacrosse coaching staff, at Elevated Lacrosse Camp! Camp is July 15-18 at Harmony Park. Elevated Lacrosse Camp will be one of the most fun weeks of a lacrosse player's summer. We will break up by age, experience and ability level so that each camper has fun and gets appropriate coaching. There is a 1/2 day option for 2nd grade and under. 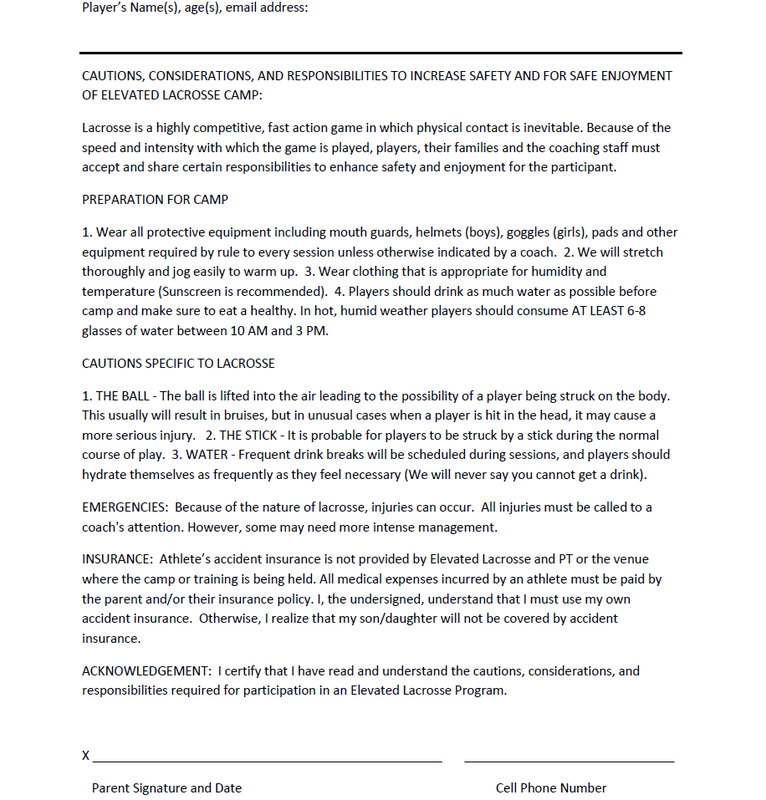 The priority is that every player gets better at lacrosse and has a great time at camp. Each day will be split between lacrosse skill, instruction and competition with other fun sports activities. 16+ hours with the stick in their hands over the course of camp. Every camper will get an Elevated Lacrosse Under Armour shirt. Current professional lacrosse players as guest coaches! Make sure to take advantage of the group and early registration discounts by April 15th. Contact Dan Deckelbaum at with any questions.